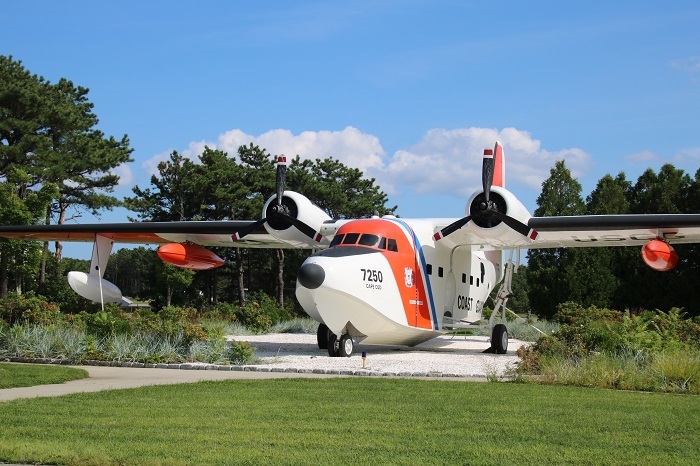 USCG air station Cape Cod. AWESOME! 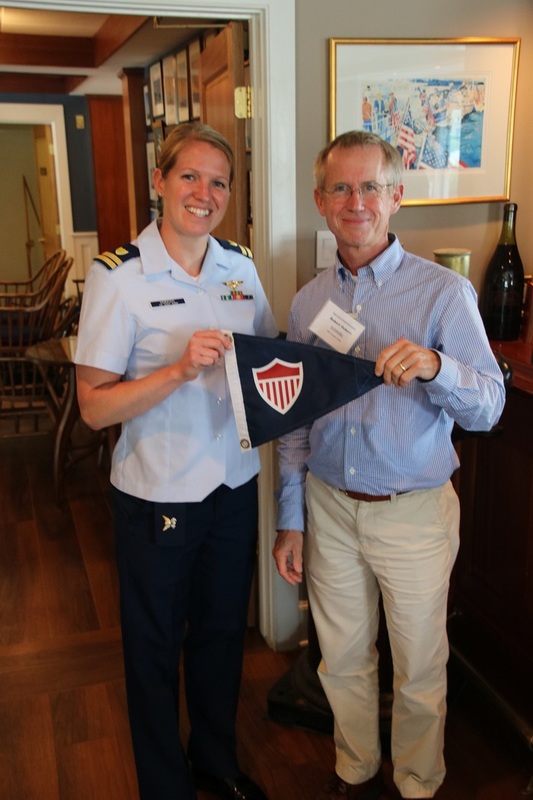 When I put on my event each June for The Seven Seas Cruising Association, I invite someone from the Coast Guard to present so that cruisers can be better prepared to stay out of trouble and if the worst happens, how to be prepared. Lt. Simmons drove down from The Cape to present to us in June and while she was visiting and we were posing together for a photo op, I asked her if perhaps I could have a tour of the airbase. Happily, she said yes. 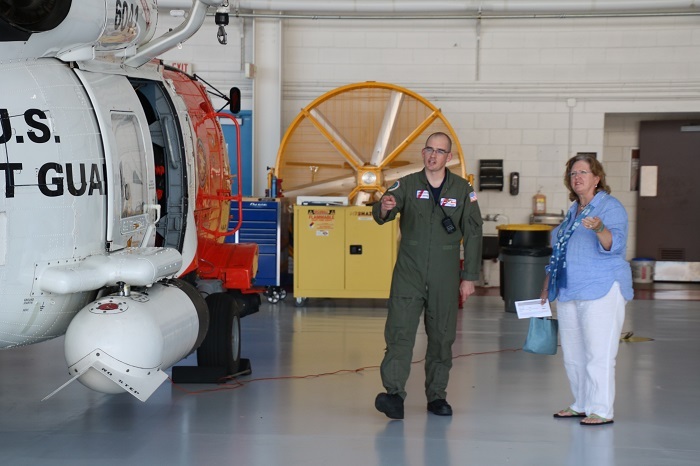 So, this Monday Brenda and I visited and were given a tour of the air station on the Cape. It was awesome. This seems particularly timely as we all watch the events unfold in Texas, thanks to hurricane Harvey. I mention this because our contact, Lt Wood, who I had been assigned to, wasn’t there as she had been deployed to Texas to assist in the rescue efforts. 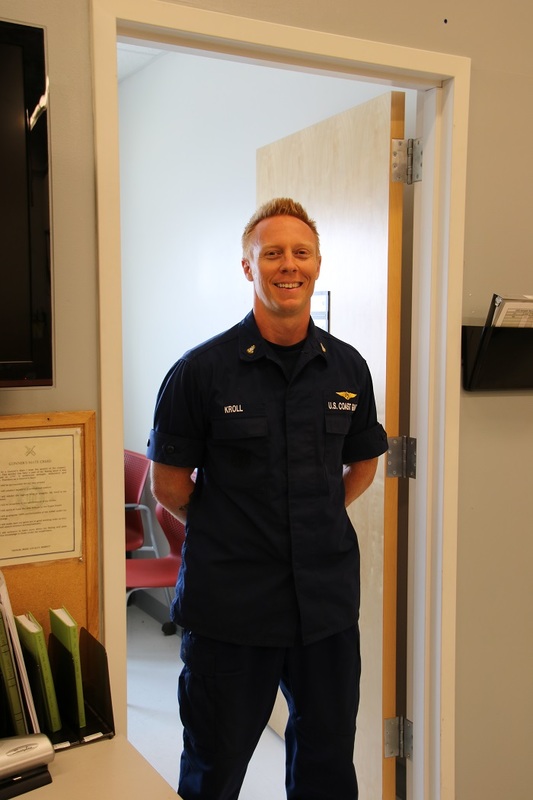 Happily, Lt. Podmore pitched in and showed us around. The facility is huge covering many square miles. 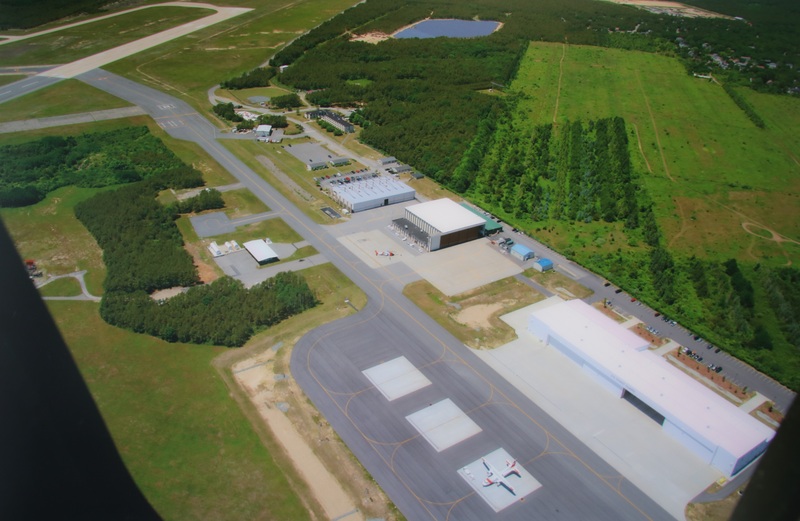 This is an aerial shot of the base. We visited the two largest buildings to the right. The first thing you encounter as you drive onto the base is a static display of a decommissioned airplane. I’d love to go for a ride in something that flies and also can also land on the water. 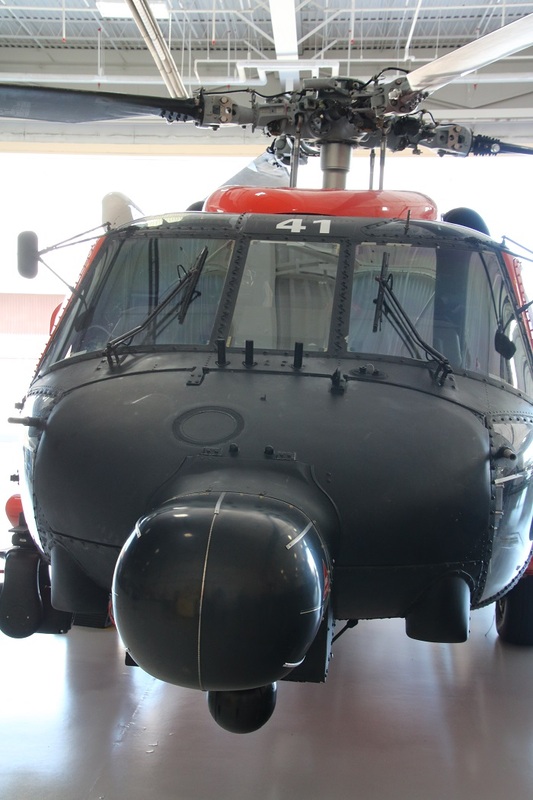 Sadly, the USCG doesn’t fly these any more. The ones that they fly today are very different. This is a EADS HC-144 Ocean Sentry. 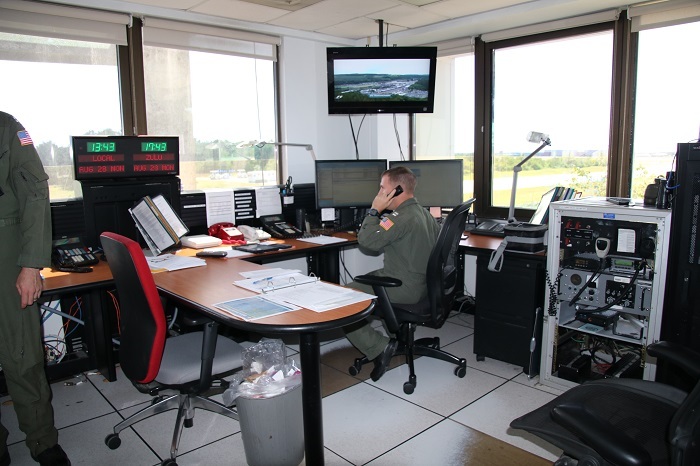 Our first stop was air traffic control. It’s not the place that receives EPIRB and mayday calls though. That’s somewhere else and then the calls are relayed to here or the appropriate sector. Very official. 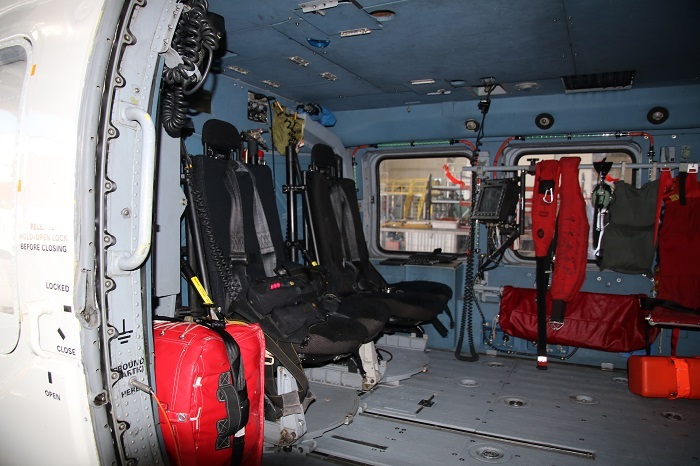 Then we went into the hanger and were greeted buy this, a Sikorsky MH-60 Jayhawk chopper. So awesome. Check more about the specs here. I wanted to go for a ride although I couldn’t even afford the gas. According to Wikipedia, these babies cost $17 million a copy and that’s before you fire up the twin jet engines. 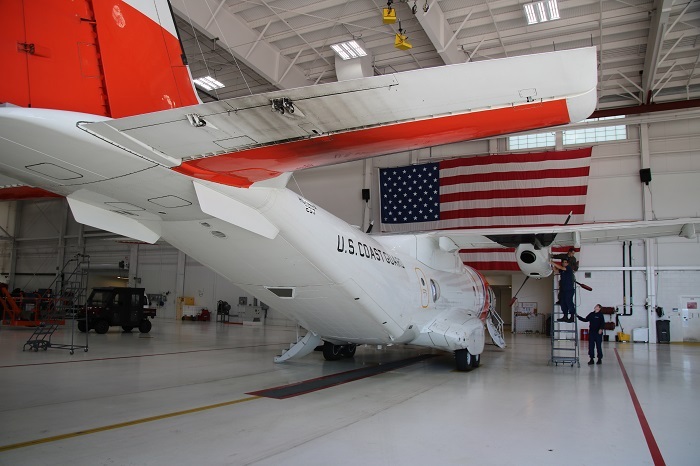 They can be flown on a SAR mission up to 300 miles offshore, stay on station for about 45 min, pick up six survivors and have enough fuel to make it back to base. 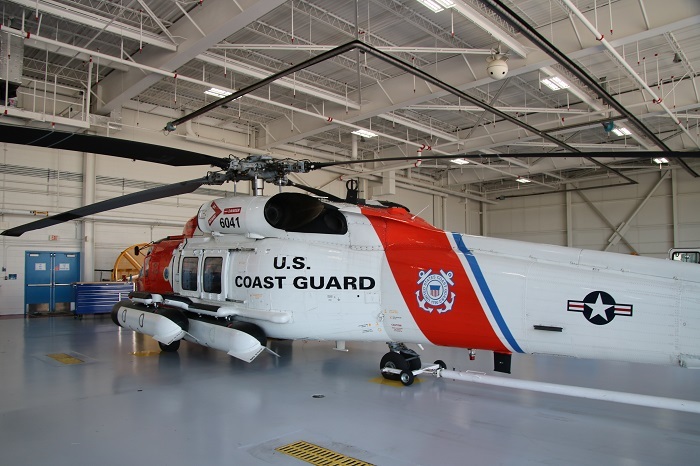 There are 42 of these in the USCG service, with three stationed at the Cape Cod station. When we were there, two of them had been dispatched to Texas to help with the rescue efforts. Our Lt. Wood and I guess Lt. Simmons too were sent to help with those. Viewed head on it looks like the serious machine it is. The bulb in the front is radar. And, given the nasty conditions that these pilots fly in I’ll bet it’s needed ALL THE TIME. 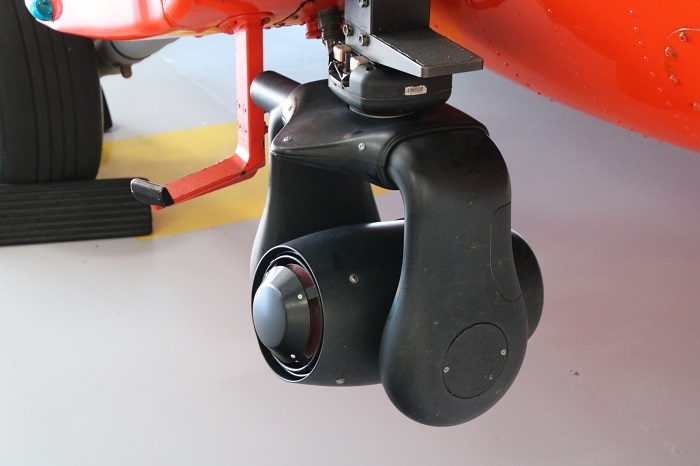 The bulb below that is a high resolution FLIR (forward looking infrared) camera. Everything about this aircraft is “supersized”. How about a search light that’s so bright it will burn anything that is put in front of it in an instant. Lt. Podmore told us that the beam is so strong that if he was to put his boot in front of it for a moment it would start to smoke. I was wearing sandals and decided to forgo the demonstration. 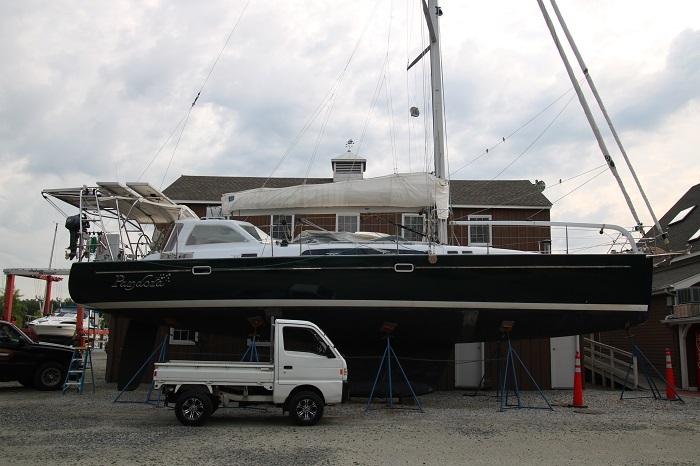 The interior is all business but I’ll bet that ending up aboard after a rescue would feel as cozy as a living room by contrast. 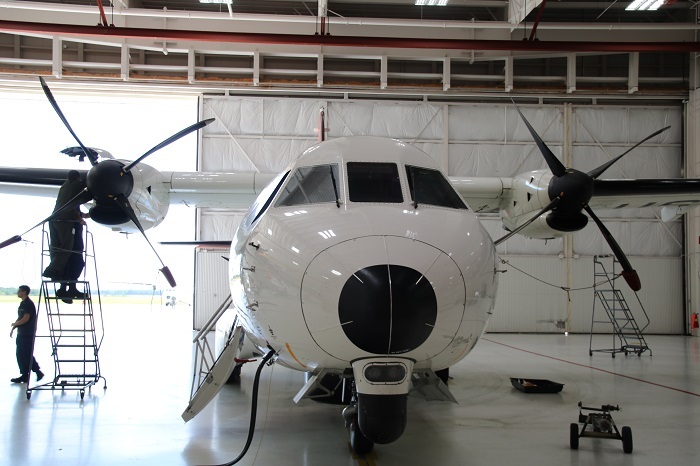 After each flight the entire aircraft, inside and out, is meticulously cleaned. And for every hour in the air, many hours are spent on maintenance. 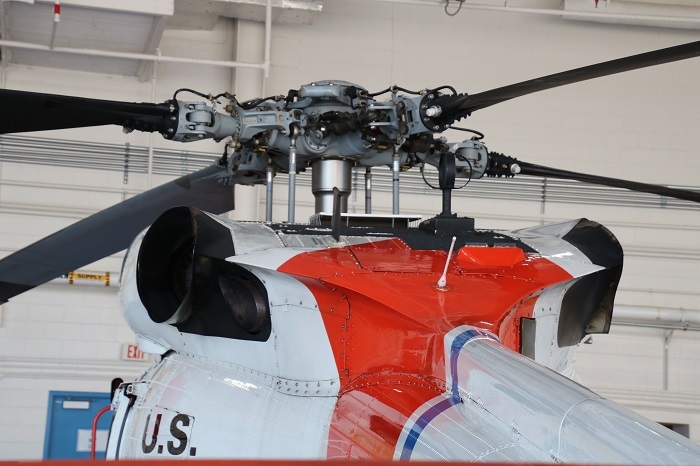 The rotor assembly looks impossibly complex. Lt. Podmore said “want to sit in the seat?”. Somehow I didn’t. Stupid me. Brenda was fascinated with the tour. Every week the crews practice SAR activities. 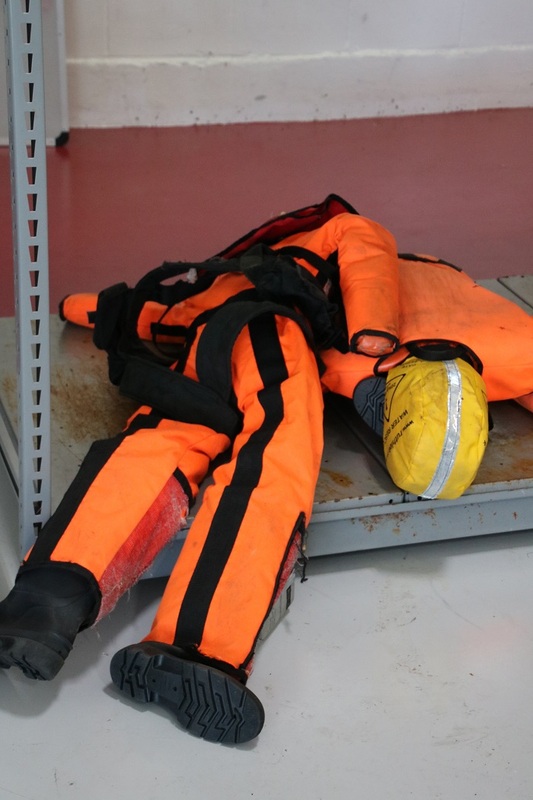 This SAR “dummy” looks like he’s been rescued many times. Actually, he loks like he could use some rescuing now. “Hey guys, It’s really stuffy down here. Can you roll me over? I’m feeling a little crampy.” Hey, this guy could be me as I am really interested in trying to work out a way to be trained to be a “rescue dummy” myself and have talked about applying to receive training to do just that. So far, nobody has said “no way Bob, fugetaboutit” yet but we will have to see what happens. One way or the other, “I’m on it” and won’t be deterred. Well, not until somebody says “no way”. So, on with the tour. 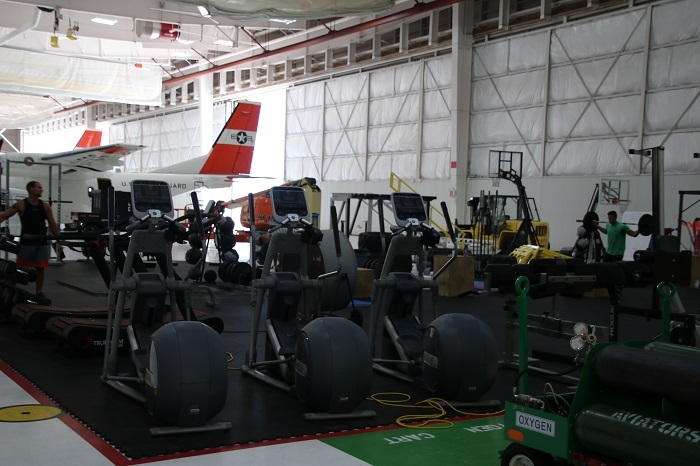 Next, into the fixed wing aircraft hanger that also doubles as a workout room. There were some totally buff guys lifting weights. And speaking of buff, or not buff. 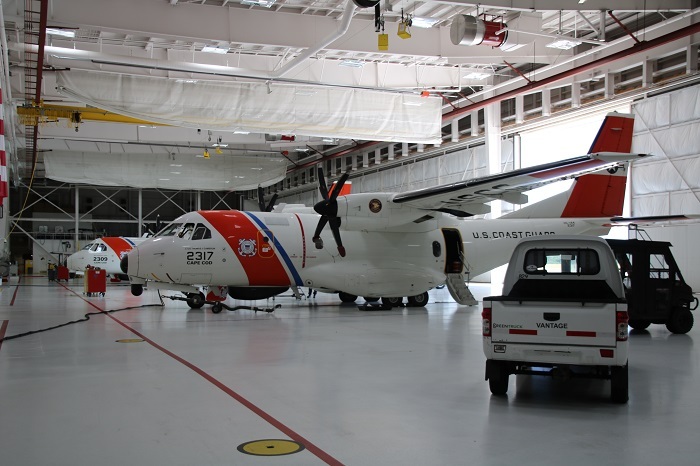 Even the USCG has mini trucks. 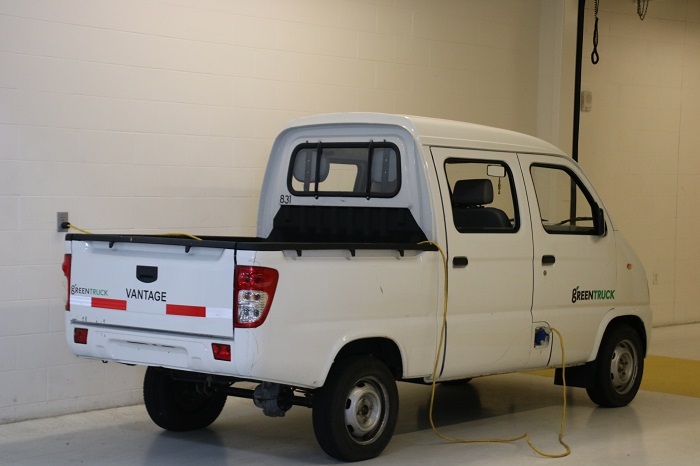 This one is electric and similar to my own “truck”. Remember mine? Looks pretty tiny against Pandora. I wish mine was electric. 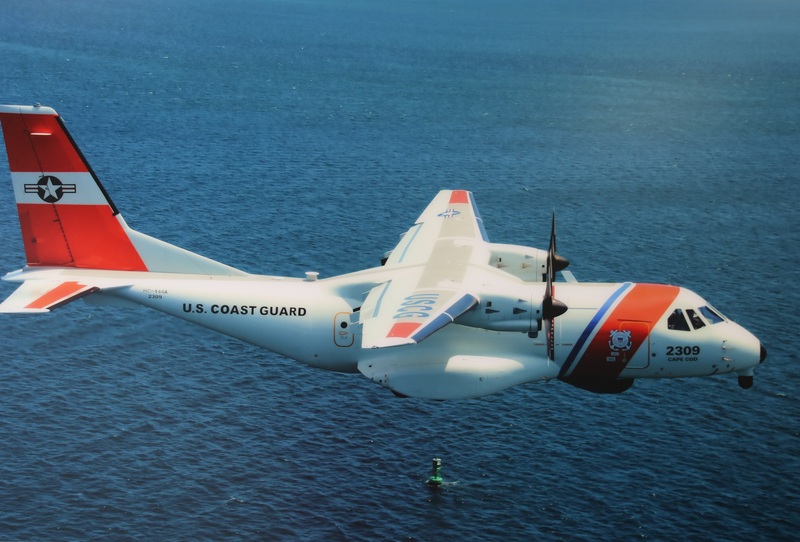 Anyway, that was a digression so back to the USCG. Past the truck two HC-144, their medium range SAR aircraft. Now, I really, really wanted to climb inside and sit up front, spraying spit all over the windshield as I made loud motor noises. However, there were guys working on it and I didn’t have the nerve to ask. Remarkably, these are manufactured in Spain. Who knew? We’ll see what Donald has to say about that. There’s a drop down ramp in the back so they can shove out stuff. I wonder what it feels like to hoist a gas powered de-watering pump out of the water onto a boat in a storm once it’s pitched out of the back of one of these? I sure hope that the “payload specialist” has good aim. “Ok, we’re going to make a slow pass to drop that 200 lb pump down to you in a minute so put your hands over your head and close your eyes, really, really tight. Don’t worry, we’ve done this once successfully.” Just like the Jayhawk, these say “all business”. 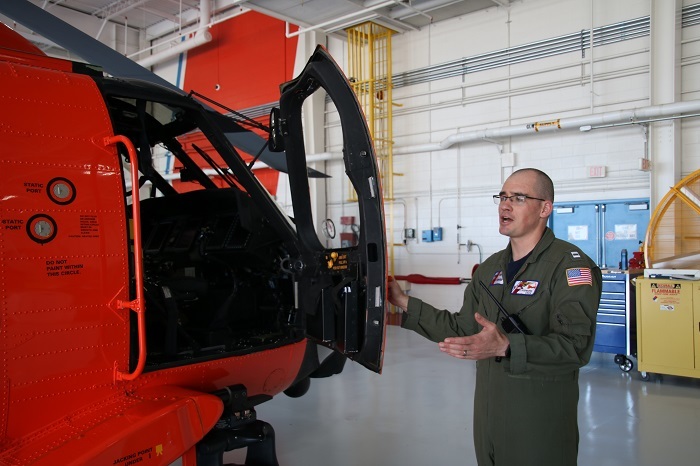 And, to make sure that all the SAR stuff that they lower and toss to those in distress is working well, you can count on Lt. Kroll to be sure that it’s all in perfect working order. He runs a department that goes over everything with a fine toothed comb to be sure that it’s in good working order. I am hopeful that he’ll be fitting me with my own personal SAR “dummy” outfit sometime soon. One can always hope. 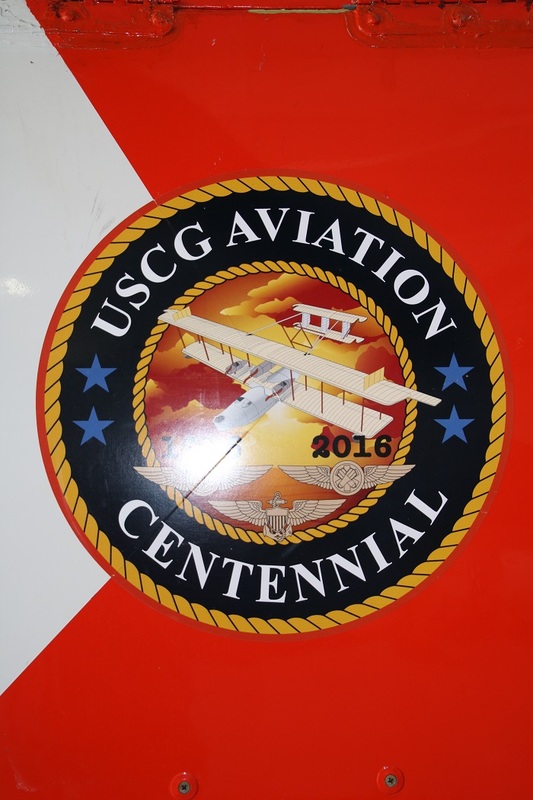 The USCG has been flying around helping folks for 100 years so they know what they are doing and do it really well. I guess that’s about it for now as the day’s getting away from me and I have to get to work on Pandora or she won’t be ready any time soon for my run south. Besides, as Lt. Podmore told me, and forgive me as I paraphrase, “The folks that are prepared are generally not the ones that we need to rescue.” Yes, I need to be prepared so I’d better get to work. In closing. “that was the most awesome tour ever”. Thanks Lt. Podmore! Can I call you Steven? And Lt. Wood. I hope that things go well for you in Texas. taking the time to share.